Perspex printed artwork now available. The final samples have been done on the new printer and we are now able to take orders for perspex artwork. Art is reverse printed on to the back of perspex and given a white backing, just like the artwork back in the day and the quality is absolutely stunning. We can do marquees, bezels, control panels and toppers etc. I’ve just picked up a really nice lot of original artwork. Some really nice pieces in this lot which I’ll be adding to the site over the next few days. I’ve just had a sort out of some of our original artwork stocks. Over the years I’ve managed to find some really nice pieces, and I’ll be gradually adding them to the store. The first lot to be added is a selection of original Perspex/plexi marquees. 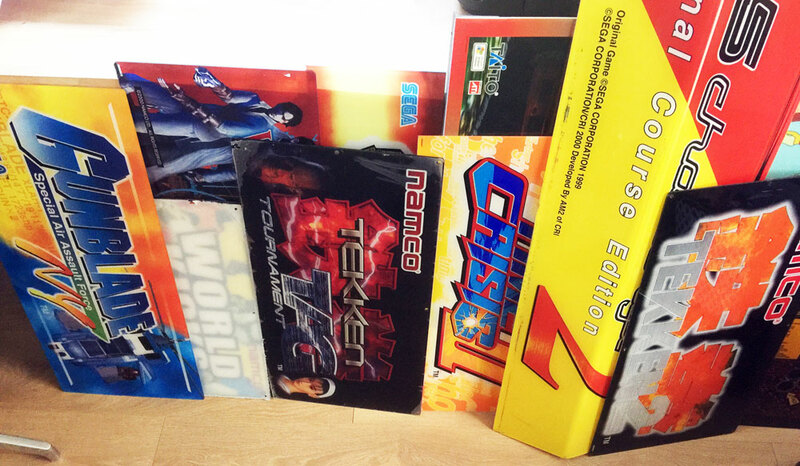 There’s a couple of really nice pieces here, including a new-old-stock Tekken Tag marquee and a full size F355 Challenge 2 perpsex marquee. You can see everything I’ve added today on the NOS and Original artwork page. 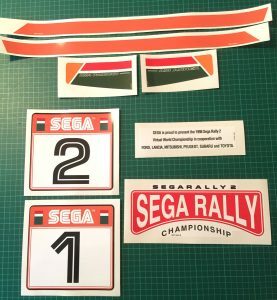 I’ve just finished adding some lovely new Sega Rally 2 pieces to the store. There’s a lot of stickers in the set, so they are being done in 2 batches, then next lot will be available next week. These are all printed on our amazing new 200 micron premium Orajet vinyl. It’s double the thickness of our regular stock, and the print quality is incredible. It has a lovely silk finish, so is much less shiny than the gloss laminated pieces, and the colours really pop. I’ll be restocking much of the store inventory on this new vinyl, so long out-of-stock and backorder items will gradually be available again over the coming weeks. We’re having a clear out, loads of stock has massive reductions, F355 artwork is half price, Initial-D artwork has big reductions, and many more items have big discounts. 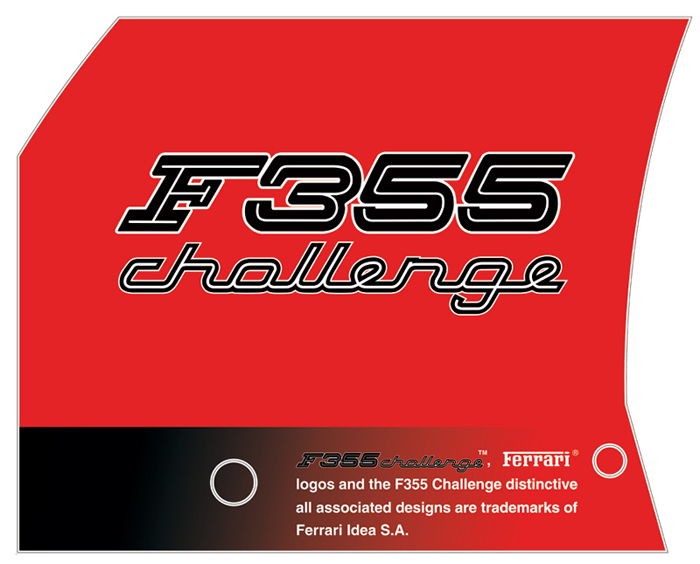 F355 Challenge artwork all HALF PRICE! Many marquees reduced by £5. 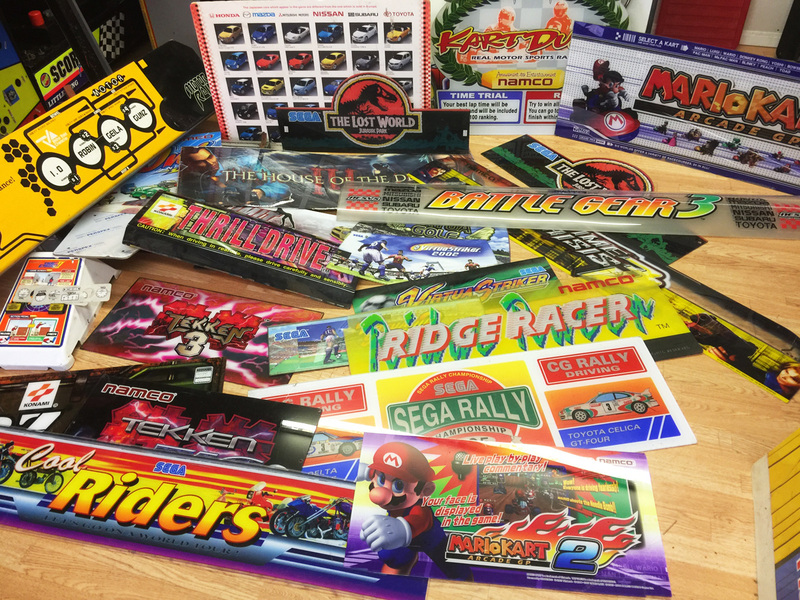 Sega Rally side art £30 off! After having a number of enquiries about the postage costs I’ve completely reworked the shipping options for the store. There are now different costs based on the size of the artwork. 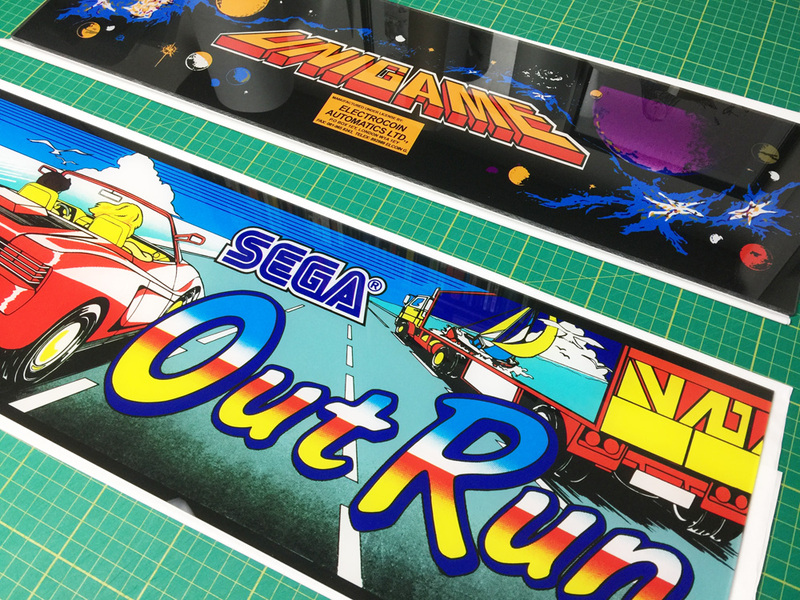 Small decals like the Sega logos, Dash decals and so on now have a Letter Rate, which is massively cheaper than before for customers who only want a few smaller decals, and all other rates for International customers have been reduced. Many items restocked and some new pieces added to the store now. A few new exclusive pieces have been finished recently too. We have Centipede Cabaret CPO’s, for the Irish built cabinets. These are a different design and brighter than the US build cabs. Initial-D 3 side art is now available. As well as the base side stickers which were fitted on ID1, 2 and 3 cabs. There are also lots more posters available, and I’m just adding some Taito Canary art, and a selection of new marquees. Some new pieces added to the store in the last week, these include Lordsvale Neo Geo MVS Side Art for the 19″ cab. 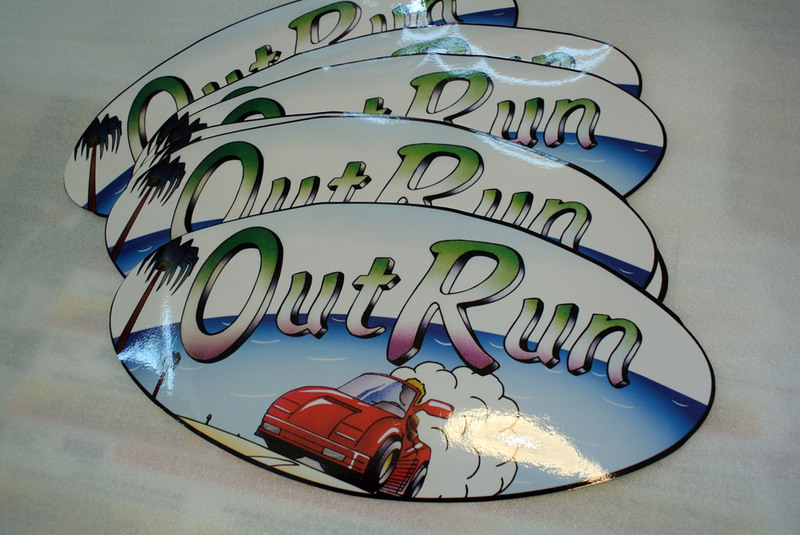 And we’ve restocked some new original Sega pieces, Ferrari Emblems, fixing bolts, shifter covers and screws, all can be found in the new section and also the OutRun 2 section. 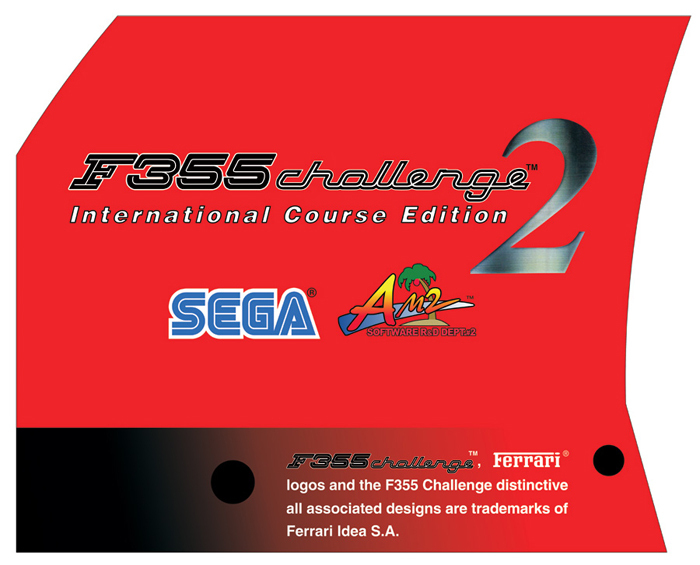 I’ve just finished vectoring the complete set of artwork for Sega’s Ferrari F355 Challenge and will be getting stock of these pieces soon. I’ve been working on a lot of art these last few months and today I’ve added lots of new items to the store. Marble Madness CPO, OutRun stripe and oval decal that fit on the front of the cabinets. Last of the Daytona USA 2 seat decals, the top black and white piece, and the No.1 and No.2 decals. 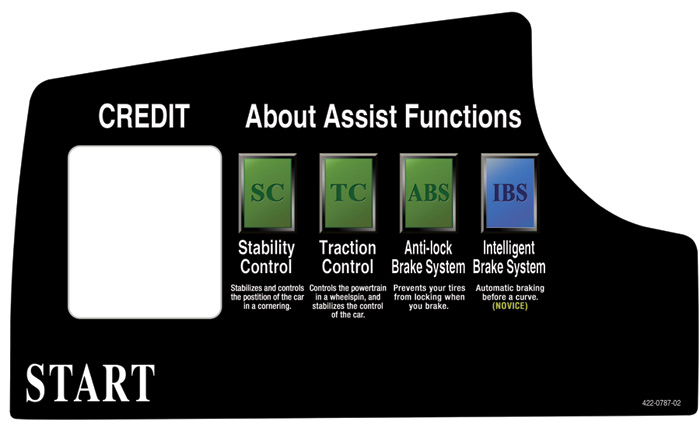 Also a lot of new control panel overlays and Blast City candy CPO’s are now available. Got a load of restocks due early next week, so many long out-of-stock items will be replenished soon!